At some point, CelestialTech became VedaLabs. Quite appropiately, besides changing their name they changed their audio program (now called AudioVeda, and with a much better interface) and changed the codec. They upgraded from PAC to ePAC. Elemedia had been reabsorbed into Bell Labs, and then Bell Labs changed their name to Lucent. So now it is Lucent's ePAC (enhanced Perceptual Audio Coder), an evolution of the older PAC. 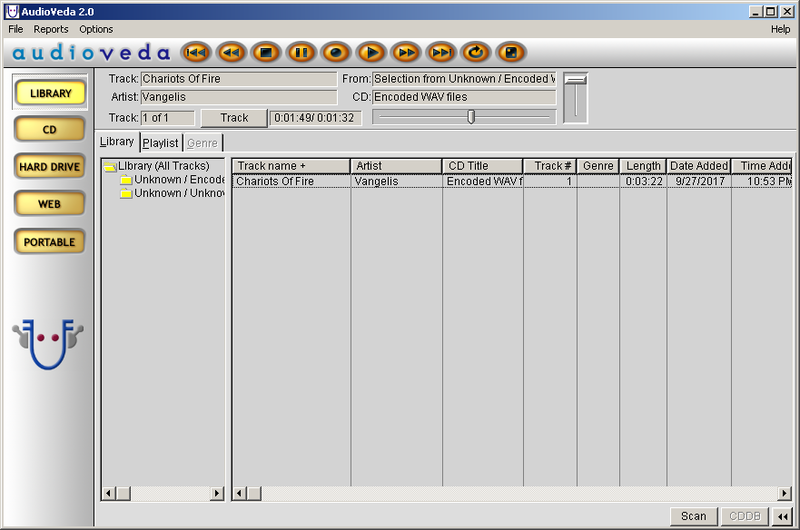 Other features in this program (compared to AudioLib) are CD ripping and MP3 playback (using the well known AMP decoding library). Also, encoded tracks are no longer stored in a database, but in individual .EPC files. Another nice feature is that the program freezes whenever you try to close it and must be killed from the task manager. It seems VedaLabs has gone out of business because all information about them disappeared and their web site went offline years ago (you can still check part of if at archive.org though). To use the ePAC routines in AudioVeda you need to register with their server - but the server is now unavailable! So I am also hosting a registry patch that fools AudioVeda into believing it has already been registered. Just unzip the patch and double-click to import it into the registry (tested in Win98 and WinXP. Some tweaks are probably required for 64bit Windows).